The people who take care of empty carts at shopping areas always seem to me to be attentive and patient, given the fact that so many careless shoppers just leave their empty carts anywhere they please after they unload regardless of the fact that storage racks are nearby. This man at WalMart was one such attentive and patient person. He was not aware of the fact I snapped his photo, but had he been I bet he would have given me a big smile. These folks are not paid enough for what they do! 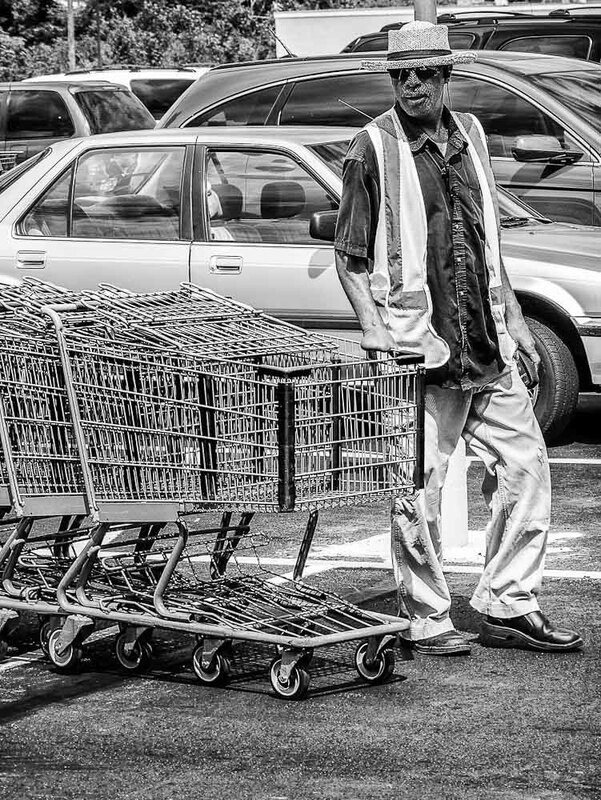 As an aside from a photographic processing standpoint, I decided to make it B&W because I felt the image was distracting with all the varied colors on nearby parked cars, and the bright colored vest he was wearing. My subject stands out better this way. I like this in B&W. Going to Florida in two week going to do some HDR stuff just for me.